Today we have 21 Trending Nails That Need To Be Looked At! Meaning, you need to look at these nails right at this moment because they all are breathtaking. Trust us, we are all about the best nail art and the best nails here at BestNailArt.com. You will be blown away by how pretty these nails are and how amazing these nails are. 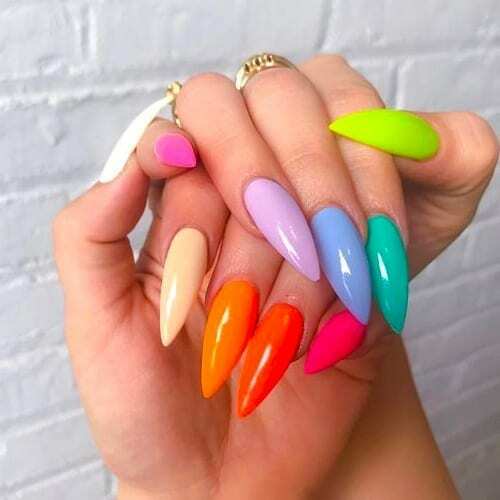 Check out the 21 Trending Nails That Need To Be Looked At below and get inspired to create your very own nail art and submit it to us. We really wanted to show off these nails first because of the meaning behind them. The pink breast cancer ribbon is truly a statement to show support for a loved one, a family member, a friend or some other peer you are showing support for. We applaud this girl who did this. Not to mention ever nail features an amazing style. Bright white and glittery pink. This is a great combination every single time. I love the solid three fingers and then the glittery pink. Very creative without a ton of effort needed. There is something about the length of these nails that is mesmerizing to me. The short nails are just cut so perfectly to form a straight line. Aside from the amazing shape, the style is gorgeous. We have bright pink, silver glitter and then a neat white outlined pattern. Very pretty! Now we have the opposite…super long nails! Sometimes it’s fun to show off super long nails. It may not be great for functionality but who cares. They look pretty and are a great conversation piece. Pristine marble or nails? Can’t tell the difference. If you zoomed in on any one of these nails and didn’t know otherwise you would think you are looking at the top of an expensive marble dining table. I love the white polish with the gold veins running throughout. This was done to perfection and we are impressed. Boom! Simplicity wins again. These nails are shiny, mint green and white offering a simple way to show off your nails. These color choice are so perfect and whatever brand of polish being used her is perfect. Come with me girl into the darkness. These nails are great for those dark color souls out there. Some of us girls don’t always want to have vibrant pink or other neon bright colors. We all want to show our dark side once and a while and this is perfect for that. I sense some DIY action coming soon from you girl. If the above nails inspire you, they should, then you can mimic this particular style pretty easily. Just get the right nail lacquers and bottles and you can get this done within an hour easily. Long purple acrylic nails? We dig it! This is the friend you need with you when your back is itching and you can’t reach it to scratch. This particular color of purple is gorgeous and the length is breathtaking. Now this is wild, right? You ever match your lip stick color with your nails? This takes some serious time and we are blown away by the precisions being used here. No need for further explanation here. Just appreciate what you are looking at. This reminds me of a roulette table or something else you would find at a casino in Las Vegas. You have the red and black color being the main staple of this manicure and those colors are deep in saturation. Gorgeous nails and perfect for your next girls only Vegas trip. This may be the most unique display we have seen in a while. If you look closely you will see a beige sort of color at the start of the nail and then a pink color towards the top. It almost looks like a bronzer on the bottom. These ombre nails are amazing. Gorgeous! Not only are these nails amazing but the picture quality is on point. The bold color of the white nails along with the purple glitter makes for a beautiful contrast. If you want your nails to look pretty for any occasion then take interest in this nail inspiration above. Why use one or two colors when you can use all of them? This may not be the perfect rainbow but all of these colors together look spectacular. The amazing thing in this manicure is that it isn’t loud or obnoxious. It actually flows smoothly and doesn’t give us anxiety. Nicely done! These nails just look so soft! The soft blue shade is so pretty. Then you have what looks like actually water droplets that sit directly on top of the nail. Sometimes the most simplistic idea turns into the best nails. Wow! Going to a baseball game this year? Or perhaps you are cheering on your boyfriends softball team? Either way, these softball inspired nails were done so well. They are mostly french tips with the neon yellow color being the tip and the red threading being the outline. You can substitute the neon yellow color with white to express your love for baseball also. Think of the first word that comes to your head when you look at these nails above. Our first thought was elegance. These nails look elegant and luxurious. These nails can be worn at a red carpet event when your donning a lovely ballroom dress. You may need to visit your local nail salon to pull this off though. In this case, the color of the polish really steals the show. I wish I knew what nail polish color that soft shade is because it’s beautiful. Then the gold accents and the gold glitter nail offer a great look to compliment the soft pink shade. Take my breath away girl. Hey girl, you’re an all star to me. If you love the looks of stars then this is the manicure for you. We have blue glitter and three nails and then blue glittery stars on the other nail. This is a cute way to be different without crazy effort needed. I swear I heard a full church choir sing in synchronicity when I looked at this image above for the first time. The shape, length, color and style makes these nails some of the prettiest we have ever seen. That soft shade of pink just melts my heart. Planning on getting married and don’t know which direction to go with your nails? No problem! Above you will find the perfect inspiration. These nails are so pretty and the three dimensional flower petals steal the show. These ombre style nails are great for those special occasions.